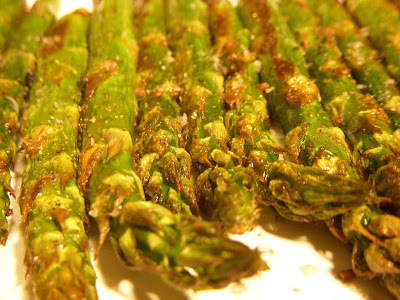 Quick Cook Idea - Roasted Asparagus. Gorgeous produce from Peru and Chile is coming into the stores in abundance. I'm not enough of a locavore to be eating veggies grown within 100 miles of South Philly. You cannot deny that the pickings are slim right now for sustainable and locally grown vegetables for healthy plant based meals. I am a sucker for asparagus, thick fat stalks that stand at rapt attention in the grocery bins. Sue's Produce, my favorite Center City source for fruits and veggies, has some amazing asparagus, plump blueberries as big around as over-coat buttons and sweet juicy cherries coming in from South America, where it is in fact nearing the peak of summer. Usually asparagus at this time of year is too expensive and spinsterly skinny. This batch however was perfect. I snapped off the woody ends and tossed the stalks onto a sheet tray. Drizzled a bit of olive oil over it, a few grinds of black pepper and a dusting of kosher salt. Popped these babies into a preheated 375 degree oven and roasted them for about 25 minutes. Turn them once after about 15 minutes. You want to attain a bit of caramelizing but not a char. Come spring and summer, try grilling the spears for an even more wonderful sweet smokey flavor. You will never want to suffer through soggy limpid asparagus spears again. As for me, I find the only other way I want to eat it besides roasted or grilled, is pureed with lemon, Parmesan cheese and a bit of olive oil, in a lighter, brighter asparagus pesto. Check out my recipe from last spring for that magic elixir of spring. I haven't roasted asparagus but I love it grilled. I'll try roasting it as soon as I get some. I usually go for the thin to med. size and not the fat ones. maybe for roasting fat is better? Roasting is the best way for the fatter, juicier spears. I do love to grill them, but I find I either lose a few to the grill gods or they crisp too much and are inedible. I won't make or eat asparagus any other way these days!